Producer(s) : PVP Jack Inc.
What is motion sickness? When the family’s raft drifts off during their white water rafting trip, Jack decides to get it back for them… not anticipating that the raft would get caught up in some rapids and Jack would have to steer his way out while suffering with a severe case of motion sickness that causes him to burp fire. What is acid rain? Against the rules, Jack brings a new ship to Earth to test out unaware that the turbo drive’s malfunctioning until it turns a regular storm cloud in a creates a cloud of concentrated acid rain….Which is due to rain on the pond. Jack has to find a way to neutralize the acid cloud before Sam’s beloved Mr Jerry (a frog in the pond) is neutralized instead. What causes earthquakes? While treasure hunting, the kids and Jack uncover an old nearby mine shaft that leads down to a mining tunnel deep below the ground. Jack goes down to explore and accidentally causes an earthquake resulting in the aliens getting trapped by a cave‐in. Are jellyfish dangerous? After Rocket eats all of Mom’s freshly made delicious fruit jelly, Jack sets off to find more jelly before anyone finds out. 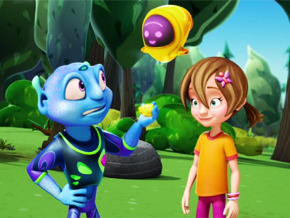 The aliens head straight for what Jack is convinced is the source of jelly heaven… a bloom of ultra‐poisonous jellyfish.